Dorothy Vaughan (played by Octavia Spencer) leads the women of the West Computing group to work on the new IBM computer in "Hidden Figures." 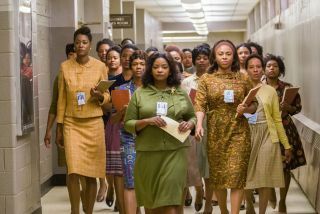 National Geographic is in the early stages of development for a TV series inspired by 2016's "Hidden Figures," a new report from Variety said. According to "Variety," the TV project will be executive produced by Peter Chernin and Jenno Topping of Chernin Entertainment, who both executive produced the film, as well as National Geographic. "Hidden Figures," based on the book of the same name by Margot Lee Shetterly (William Morrow, 2016), follows black women at what became NASA's Langley Research Center in Virginia who computed the trajectories that propelled the United States' first satellites and spaceships into orbit. The movie focuses on Katherine Johnson (played by Taraji Henson) and the lead-up to the first American to orbit the Earth, in 1962. National Geographic is also developing a dramatic series based on Tom Wolfe's "The Right Stuff" (Farrar, Straus and Giroux 1979), which chronicles the lives, training and missions of NASA's Mercury astronauts. Actor Leonardo DiCaprio and Jennifer Davisson of Appian Way Productions will executive produce that series, along with National Geographic.